Let’s talk about tapas, shall we? I’m going to be starting a new feature all about tapas soon, so let’s start by finding about what they are. It’s thought that originally in the wine-making regions of Andalucia, a cover in the form of a small plate or lid was placed over glasses of wine to keep fruit flies away. Titbits of food were later placed on the lid to be eaten with the wine. The word “tapar” in Spanish means “to cover”, which is where we get the word “tapas” from. How wonderful that Spaniards thought it unacceptable that a fly ends up in your drink, but it´s fine if it lands on the accompanying snack! 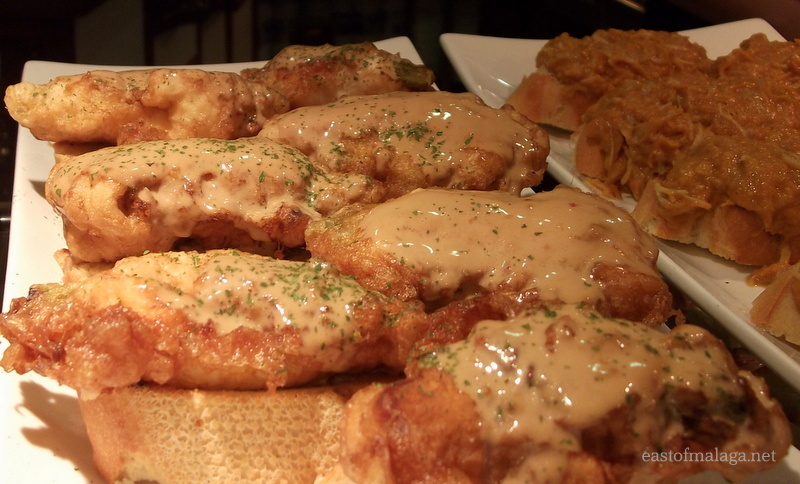 Either way, the idea spread, so that nowadays the types of food served as tapas are limitless. Most Spaniards don´t drink alcohol without a tapa and many bars, especially in southern Andalucia, provide them free of charge. The original Spanish “fast food” is usually displayed in refrigerated glass cabinets on the bar and served in small terracotta glazed dishes. Some examples of the type of tapas normally available include gambas (whole cooked prawns in their shells), boquerones (fresh anchovies in olive oil, vinegar and garlic), chorizo (spicy Spanish sausage), albondigas (meatball…often in a creamy almond sauce), queso (cheese…often manchego), habas con jamon (broad beans with ham), ensalada rusa (Russian salad) or just a few olives. In many establishments, if you stand at the bar along with the locals you will be given one tapa free with each drink you buy. That’s right …. free food! Should you choose to sit away from the bar, you can pay for a tapas or two (usually about one euro in this part of Spain), or opt for a larger serving known as a ración (ration) or medio ración (half ration). This is a great way to eat a variety of dishes, and a pretty sociable activity as groups generally tend to share their dishes. This entry was tagged Andalucía, culture, customs, East of Malaga, Europe, Food, life, lifestyle, Malaga, photography, Spain, Spanish bars, Tapas, travel. Bookmark the permalink. Love your topic! Pretty much the current trend here in the East for the last few years! Can’t wait to see your posts. Well you are welcome as ever Marianne! YUM … I like all of these. They look delicious. I’ll have one of each. We don’t have tapas bars here in Florida. They do have appetizers but it’s not the same. I make tapas when I have company. You can be very creative in what you choose to make. I’m surprised the tapas idea hasn’t caught on in Florida, especially with the Hispanic influence. It’s such a sensible way to eat, isn’t it? Ah yes, I do remember St Armand circle. Lovely! Oh my! Now that sounds absolutely delicious Marianne! I wouldn’t stop drinking! LOL! It’s funny how soon eating tapas becomes a way of life here, Sophia. Nooooo, I want the tapas for free. They can charge for the drinks! LOL! I was just looking at tapa places in Louisville, KY. A friend of mine introduced me to tapas about a year ago. They are wonderful in the United States, too. …and do they still come free with a drink, too? Your photos and vivid descriptions have my mouth watering… So enticing! Thanks for saying so – much appreciated. That sounds amazing! I think tapas is very overrated over here in Australia. I would definitely like to experience the real thing! I’ve had tapas in Australia and I have to agree with you. It’s the same in the US, and UK – usually quite expensive too. The authentic Spanish experience in Spain is very different. Hope you get to try it out one day! Yeah – tapas brings good memories doesn’t it? If the fly lands on your snack you can brush it away. If it lands in your wine, not so easy. Rethink. Personally I don’t like flies anywhere near my food OR drink. Filthy creatures! I can imagine, Amelie – guess you’ll just have to come back for more! I am glad you told us what a tapas is…I had no idea. You’re most welcome – glad you enjoyed it and thanks for letting me know. Even seeing this in the morning is making my mouth water. I love them all (yum yum) but that last one, I’m ready for that! Mmmm it’s funny how that happens – at any time of day, isn’t it? Oh yum! 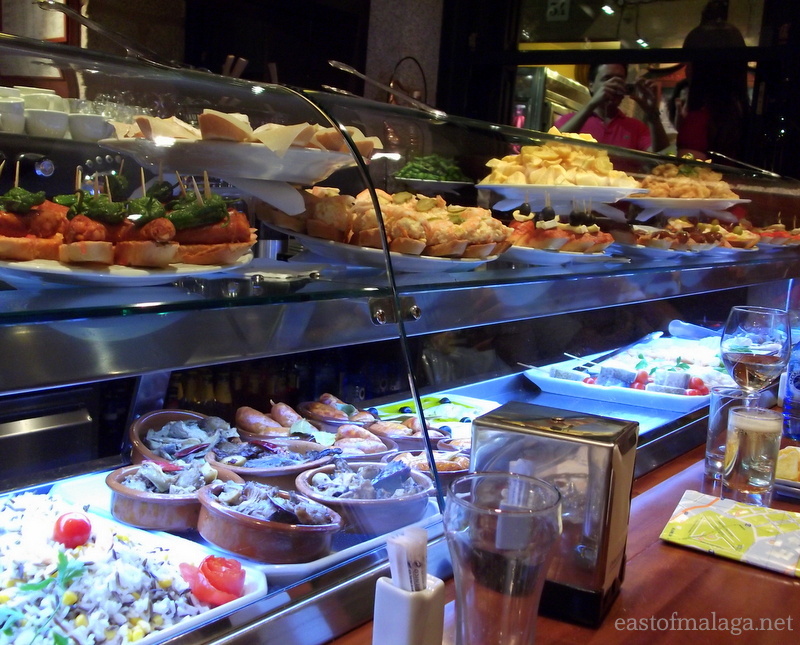 I`d fantastic tapas in a bar in Girona last Spring. Have tried to replicate some of those delicious recipes since but dang! they just don`t taste as good. I guess it’s the whole ambiance needed for the authentic experience, but hopefully you’ll be able to replicate some tasty tapas as my new feature gets underway! Oh, yummy! Can`t wait to try some of your recipes! Sharing is wonderful -and your tapas sound yummy, EllaDee. I can’t choose a favorite either – I like all that variety! Like me then, Meg, I like most of them too! Nice, tapas seems to be rather expenesive here! I think nice tapas are very expensive everywhere but in Spain, Gilly! Where I live the tapas are free with every drink, even soft drinks. The difference here is you don’t get a choice of ‘tapas’. If you want a choice you order a raciones which, as you said, you pay a nominal fee for. A typical evening in our local bar would be: a slice of barras with serano ham and cheese, a mini hamburguesa, a dish of carne en salsa or barras with gambas and tomatoe. I tend to get bloated with the amount of coke I drink just so I can continue trying the tapas ha ha. Some of the bars here are the same – you get what you are given, tapas wise – but most have a choice. And yes, you still get a free tapas with soft drinks. Yum yum …. Not sure about the line “EVEN” in the Axarquía villages – I’d have said “ESPECIALLY in the Axarquía villages!!! Of course, you are quite correct, Tamara. Ooooh! Delicious post, Marianne! I love love tapas. My favourite has to be bacalao en tomate – and it’s only 30 cents per tapas in my village! I also like to get a plato variado to share in the evening. 30 cents! WOW – where’s that Louise? I think sharing is one of the best things about tapas, don’t you? A refresher course on tapas never does any harm! …and, even better, I get to go out and do the research! Impossible to choose a favourite tapa or tapas bar – people ask me that all the time and I can’t answer other than to ask them “what’s your favourite song?”. I agree Shawn – but there are some bars that we might not return to in a hurry! 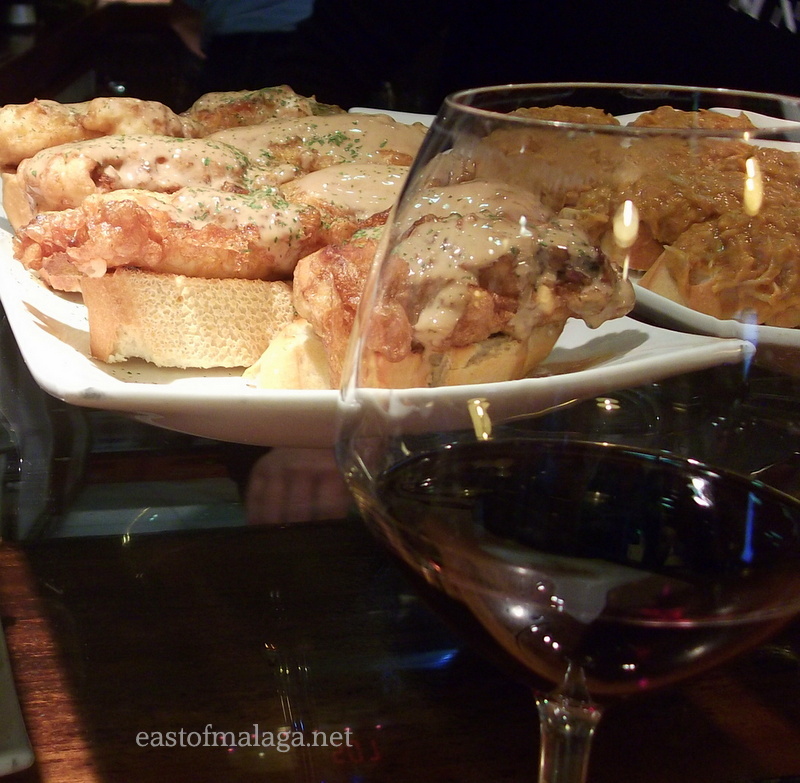 I’ve been looking at some of the suggestions on your blog for great tapas bars around Malaga. Looking forward to checking out some of those soon. Mum mm, tapas, lovely! Like your informative post, I hadn’t known the origin of the word…. Gambas and boquerones for me! Mmmmm … yes, LOVE boquerones, Sue – I’ll be featuring those quite soon!! 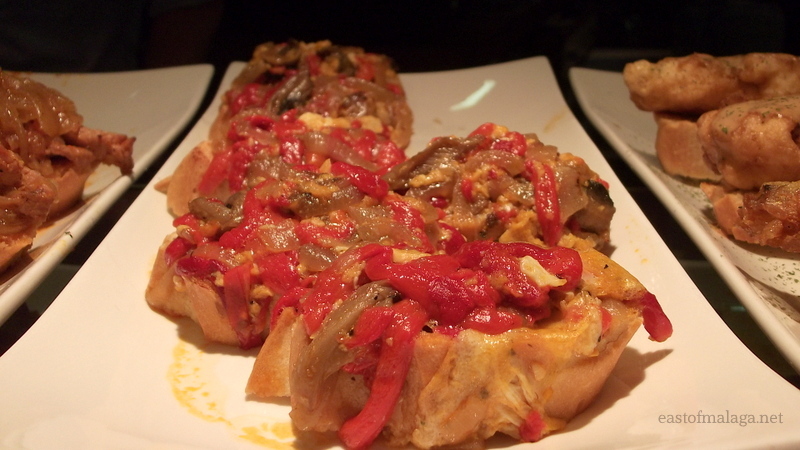 I look forward to your posts – tapas – one of the nicest things about Spain. I like the story that the King Alfonso the Wise invented the Tapas. Haven’t heard that story, Andrew, but I’m not surprised they thought a King invented them. I’ll feature a different tapas each time. Which is your favourite? That’s too tough a question, I like them all but I actually don’t think that you can beat a really good tortilla! According to the legend, the tapas tradition in Spain began when the King of Castile, Alfonso the Wise, visited a tavern in the town of Ventorillo del Chato in the province of Cádiz, and ordered a glass of sherry. On this particular day there was a gusty wind, so the innkeeper served him his glass of sherry covered by a slice of ham supposedly to prevent the sherry from getting dirty – but more likely because he didn’t want to have his head cut off! The King finished the sherry and ate the ham, and when he asked for a second glass, he requested another tapa or ‘cover’ just like the first. OH I love your story, Andrew. Thanks for sharing it. I enjoyed the stories about the origins of tapas–and the pictures are mouth-watering! Tapas are such a sensible way to eat – smaller portions to see how you get along!